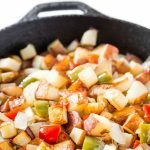 Potatoes O’ Brien is a really quick and easy skillet side dish that combines crispy potato cubes with green and red bell peppers and onions. 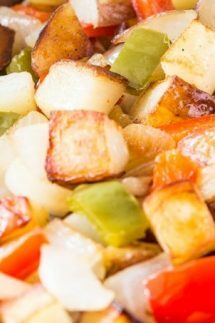 The Potatoes and Onions are gently fried so that the Potatoes O’ Brien are nicely browned, then mixed with the cooked vegetables and served hot. If you’re wondering where Potatoes O Brien come from then I’m sorry to disappoint, but the origins of the dish are somewhat disputed depending on who you ask! Some say it originated in a Boston restaurant named Jerome’s, while others claim that it hails from a Manhattan restaurant during the same time period. In any event, it tastes great no matter where it came from and makes a perfect side to serve with breakfast, brunch, or dinner. It’s a really versatile side dish and it’s gluten free and whole 30 compliant too. Step 1 – Cut the red potatoes in half but do not peel them. Step 3 – Drain the potatoes and chill in the fridge. 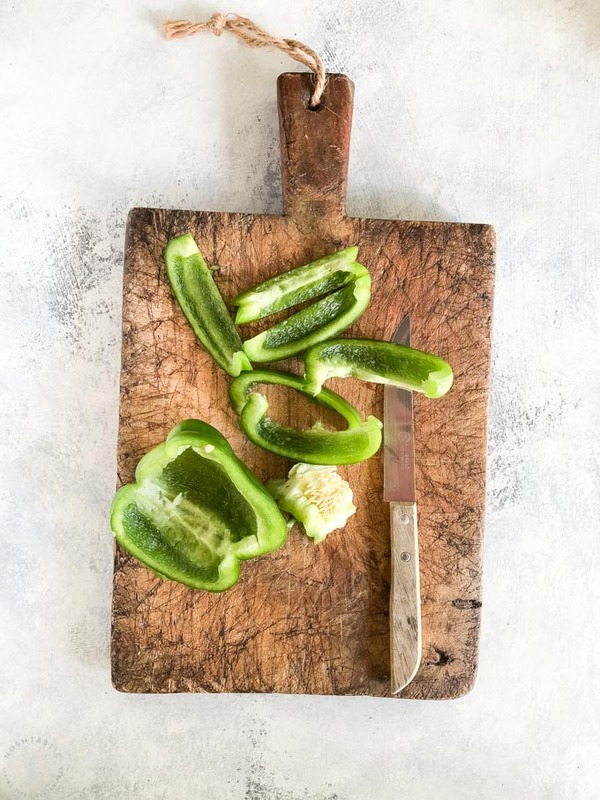 Step 4 – While the potatoes are chilling you can prep the bell peppers, remove the seeds and stem and cut them into small squares. 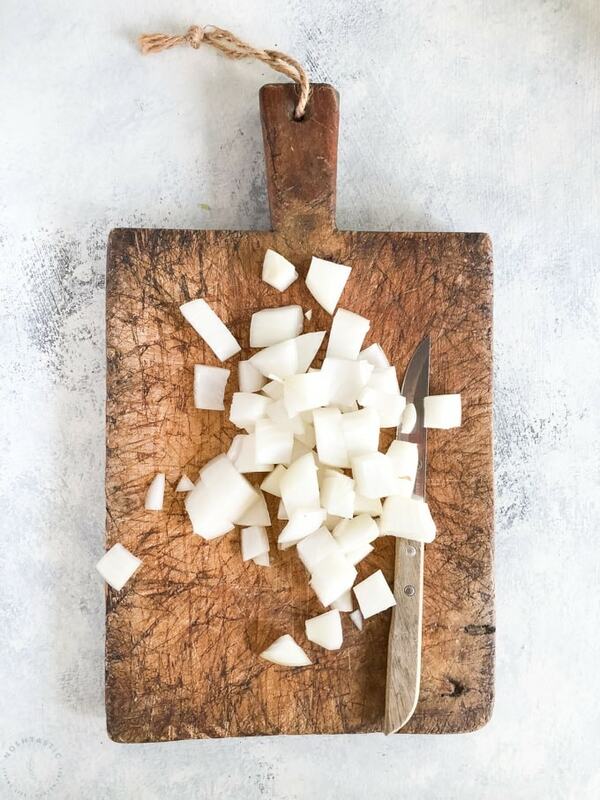 Step 5 – Chop the onion into similar sized chunks as the bell peppers. 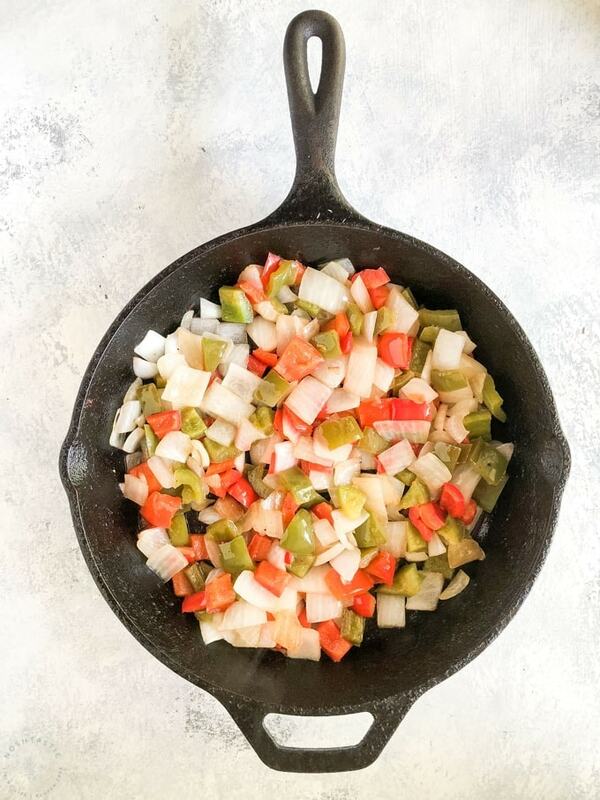 Step 6 – Saute the onions and peppers in a skillet with a little oil for about 5-6 minutes or until tender, then set aside. 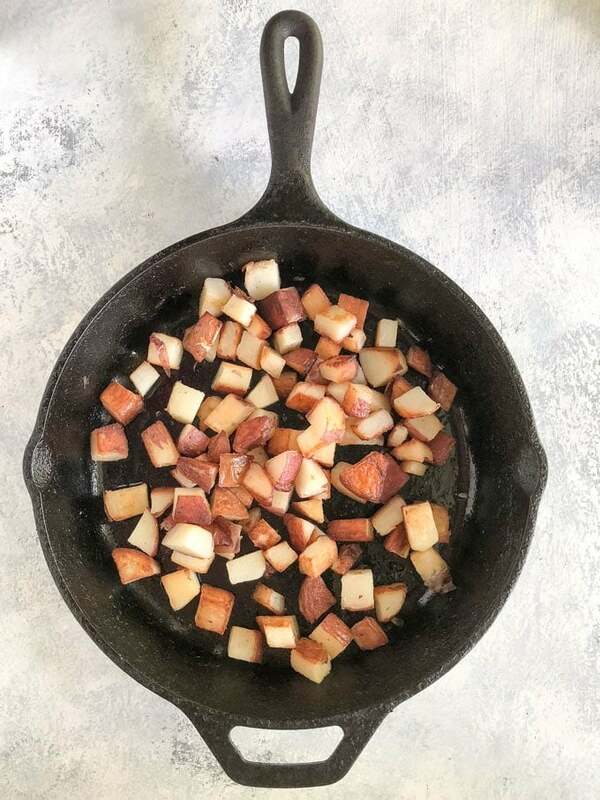 Step 7 – chop the cooked cooled potatoes into small cubes, then add a little oil to your non stick skillet and saute the potatoes over a medium high heat. Turn the potatoes every 5-6 minutes to get them nicely browned. 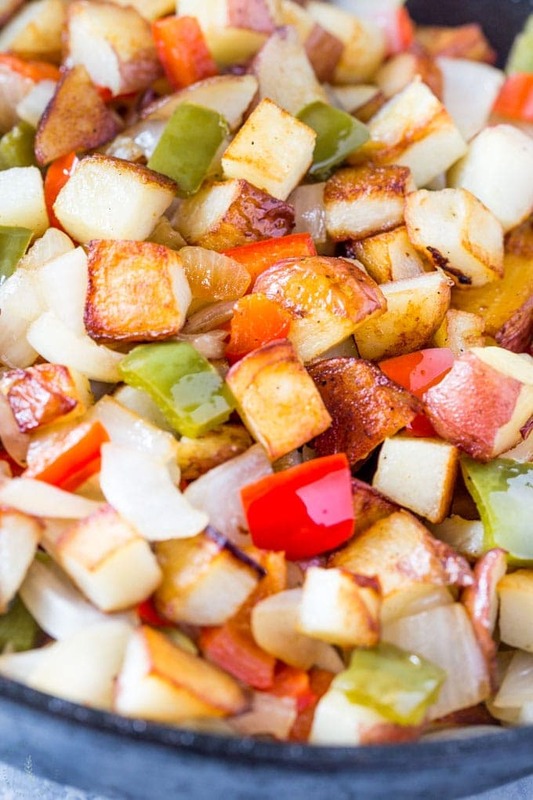 Step – return the bell peppers and onions to the skillet with the potatoes and warm through, then serve hot. I like to use red potatoes as they hold up well for this dish. 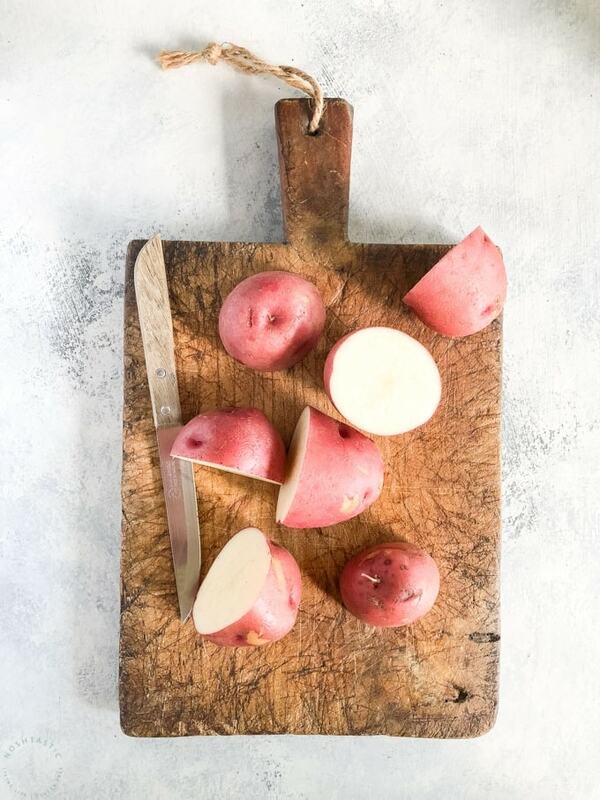 If you don’t have red potatoes then choose another waxy or all purpose potato variety such as Yukon Gold. Avoid the more starchy potatoes if you can. You can cook the potatoes a day or two ahead, cube them and keep them in the fridge until you are ready to cook them. 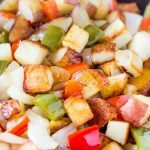 I recommend cooking the bell peppers and onions separately from the potatoes as I found that the potatoes took longer to fry to get those nice crispy brown sides and I think the other vegetables would be overcooked by that point. 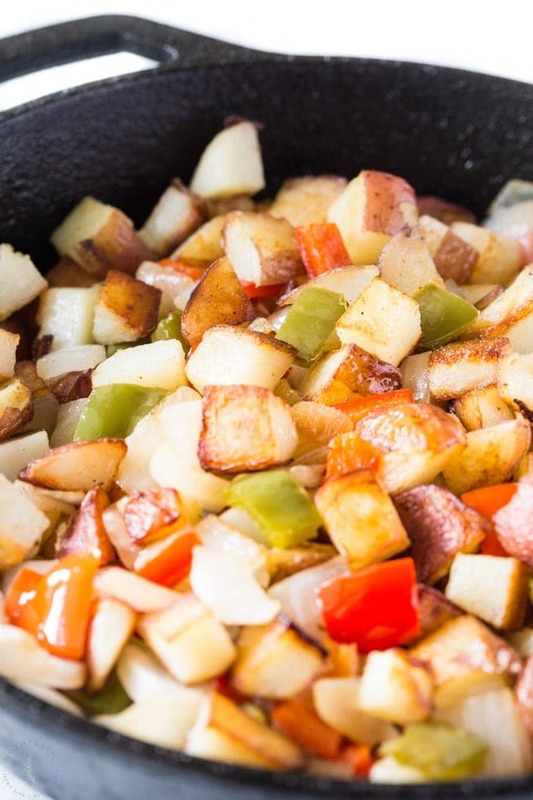 To reheat your Potatoes O’ Brien you can warm them in a skillet over a low – medium heat, or microwave. Just be aware that you will likely lose some of the crispiness on reheating. Sharp knife – this is a must! A blunt knife is nobody’s friend so do yourself a favor and get a sharp one. Cast Iron Skillet – I love my cast iron skillet and use it daily, if cared for properly it will last a lifetime! 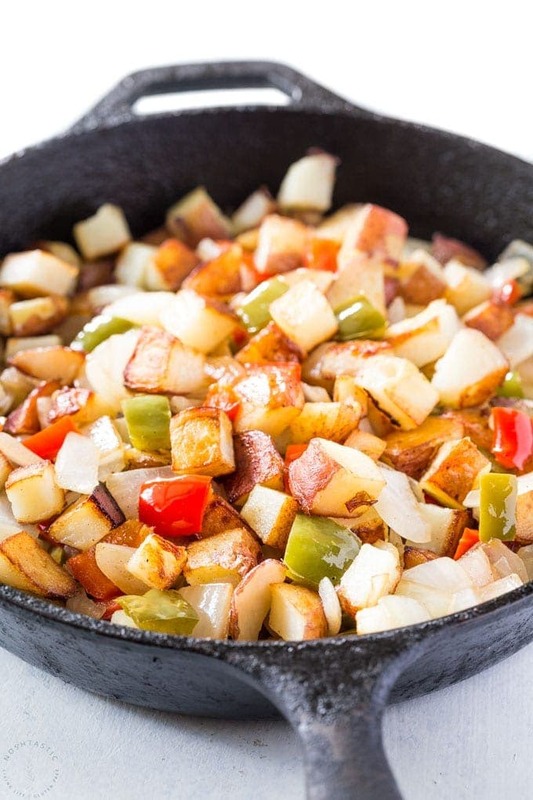 Potatoes O Brien are a quick and easy skillet side dish that's perfect for breakfast or dinner! 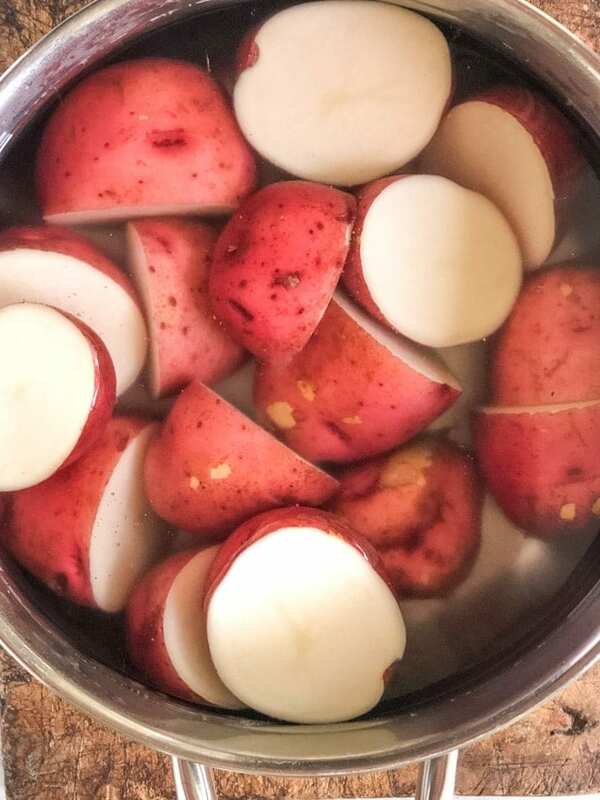 Boil red potatoes until tender, I cut mine in half to cook so they don't take as long. Drain and chill the potatoes, then cut into once inch diced pieces. Saute the green and red bell peppers and the onions with 1 tbsp of the oil in a non stick skillet for about 5-6 minutes or until softened, then remove and set aside. Add the remaining oil to your skillet and warm over a medium high heat. Then add the diced potatoes in a single layer when the oil has heated up. let the potatoes cook for about 4-5 minutes per side, then turn them when they are browned the way you like them. Once all the potatoes are browned, add back the bell peppers and onions and let them warm through, then serve hot and season with salt and pepper.